Kimoyes item: 22801 - Boro is an ancient “craft” which arose from the need to patch clothing and bedding with cotton patches to extend the life of these necessities in cotton poor northern Japan. Boro is an ancient “craft” which arose from the need to patch clothing and bedding with cotton patches to extend the life of these necessities in cotton poor northern Japan. It is now a popular modern sewing technique. Vintage boro, or “unintended art” is highly sought by many. 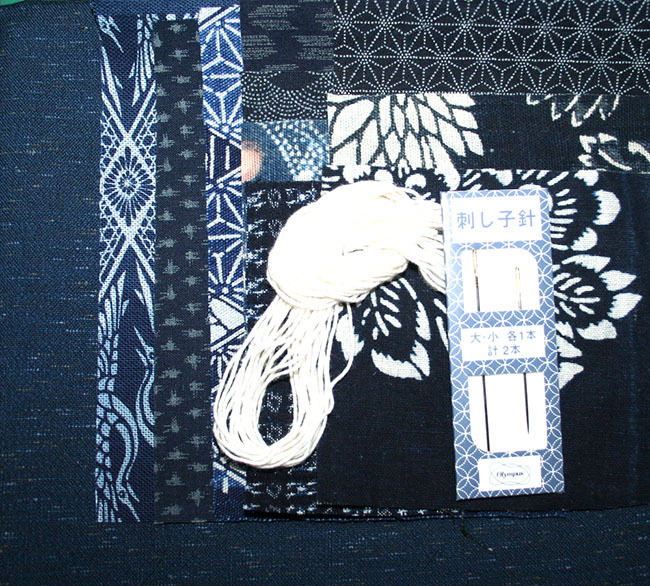 This kit contains six 4 inch squares, four 4 x 6 inch squares, 10 metres of ecru sashiko thread, 2 x sashiko needles and a 14 x 14 inch piece of plain blue kimono fabric. Fabrics are a mixture of blue cottons, both new and vintage. The photo is a sample of the pack and fabrics may vary depending on availability.